without ever having gone to see it." I feel quite impacted by this verse. I think it addresses the struggle I'm going through now about whether I buy an RV or buy a house in Tucson. Do I choose to be stuck with possessions (buying a house) or be free to take off and visit other cities, states or countries (in an RV with few possessions)? What struck me is how I spent a good portion of my Thanksgiving day. 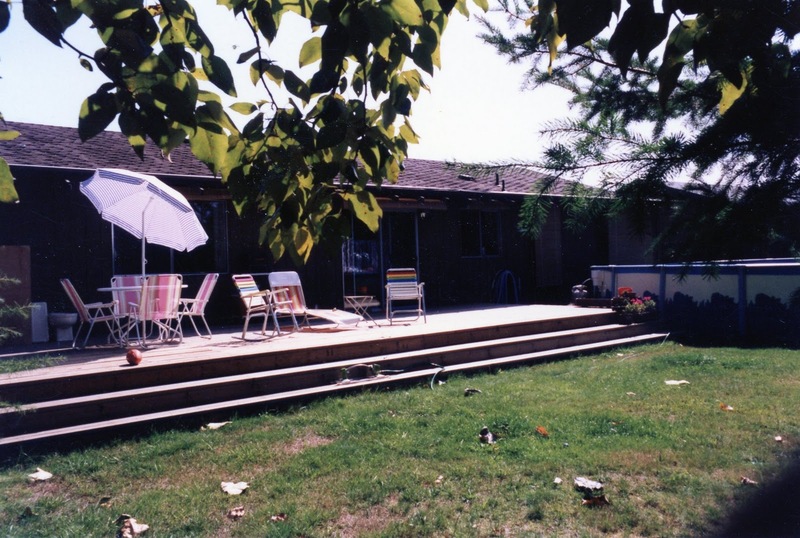 I spent hours on the internet looking at 1700-2000 sq ft houses, with a pool, in Tucson. What I finally realized is that most of the houses I'm looking at are too big, especially for one person. I currently live in a lovely house I inherited from my dad that contains three bedrooms, a formal living room and dining room, a family room and a two car garage located on 1/3 of an acre. I spend most of my time in the kitchen/family room or my office, unless it's warm, then I'm in the back yard. I figured out a long time ago that I don't need this much room so why I'm looking for another house the same size is beyond me. Then there's an RV, which is essentially one long room. It has minimal storage so downsizing is imperative and freeing, and it's mobile. Again, there's size consideration from a Class B to an extremely long fifth wheel. Miss Minimalist is all about getting rid of stuff. I've been doing that since I inherited the house, but sometimes I get stuck just from the sheer enormity of the task. Forty years of someone else's accumulation can be overwhelming and I'm taking it a bit at a time. On Thanksgiving I went through kitchen drawers and boxed items I've never used to take to Goodwill. When I cook, which is rare, I contemplate all the many pots and pans my mom accumulated and have figured out that I probably just need two. I was thinking about what would fit in an RV and that made it easy to choose. I've asked myself if buying a house in Tucson is so that I can hang onto my possessions and a part of me says a resounding "yes." That was a shocking eye opener (remember the buffet blog). Then there's the question...Why would I buy a house in Tucson when I have a perfectly good house in Seattle? Answer...Weather, weather, weather. What about the weather in Tucson that's not so great, i.e., months of hot, hot, hot??? because I honestly don't like hot. What I like and feel drawn to, are the blogs where the writer is on a beach, because I'm drawn to water. I go to water to heal. Where's the water in Tucson besides the pool in the backyard? Are you hearing the arguments going on in my head? I hear it all the time, and, fortunately, so far, it isn't enough to have to get prescribed meds. I think as long as I keep the dialogue going I'll continue to ask the questions to find the right answer. And I'll continue to read all your blogs and travel vicariously through you, for now. After my trip to Tucson December 5th, that is. And...I really do like watching all the "stuff" leave the house because I feel so much lighter as it goes away for someone else to appreciate. Now that's Thoughtful Contemplation. Happy Thanksgiving everyone!! I was going to work out with my trainer this morning, but Mother Nature saw things differently and sent us snow. I thought I had plans for today but now I don't since I won't drive in snow. My cupboards are going to need replenishing soon so I hope the promise of rain this afternoon comes true. You saw it here first...me hoping/begging for rain. I've been housebound since Monday and I'm ready to get outside. Is this a great picture, or what? Poor guys are so cold they've been staying at the feeder longer so I was able to get this picture and a couple others that I really like. I think this picture is the highlight of this post. I'm suffering from cabin fever but it's looking like I can get out of the house soon, if I want. 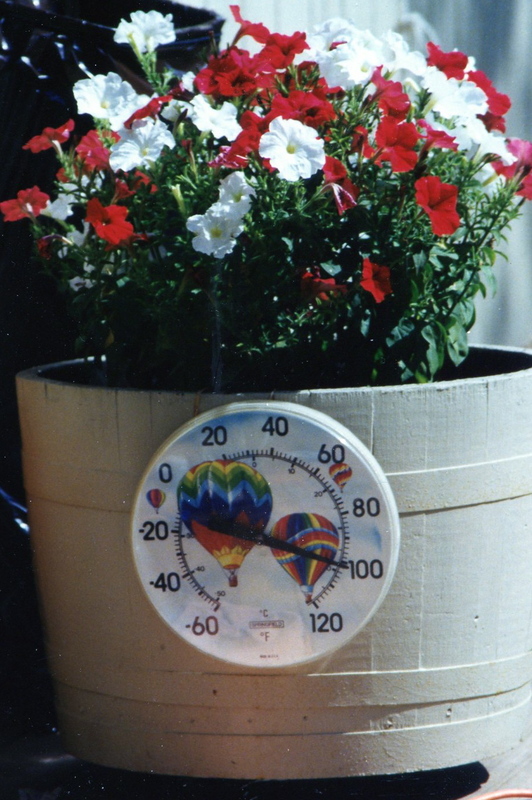 It's "only" 30 degrees now and the forecast says it will get warmer overnight. The street in front of my house is looking passable enough for me to venture out on. When I had my ancient 5 speed Volvo sedan with four studded tires, I'd be out on the road with no problems. With my new 2010 Volvo SUV, automatic, no studded tires, it stays in the garage, which means I stay in the house. I finished filling in the holes from the shelves I took down in the closet and painted the walls, so now it's presents as a closet once again. Glad to have that done. That led to finding holes in the window frames in the family room and hallway so I took care of them while I was at it. I've been having trouble reaching my best friends in Tucson, a married couple. I just got an email yesterday that the husband is in intensive care and I'm not sure what his outlook is. Please send prayers and positive vibes his way. I'm really glad I'll be in Tucson December 5th. I missed working out with my trainer on Monday, due to the weather, and the other two classes I attend at the gym were cancelled due to the same weather and Thanksgiving. Fortunately, my trainer is working tomorrow morning and she called to let me know she had a cancellation. I have a routine I go through at home two times a week, but it doesn't involve weights and working with her is all about weights. I can tell I missed one day so I'm really glad she has an opening. Normally I meet with her Monday and Friday but she's taking Friday off to have a long weekend and now, due to our weather, go skiing since it sounds like the ski areas are starting to open. I think that covers it for today. Happy Thanksgiving to you tomorrow if you don't have time to read any blogs. I'm five posts away from receiving an award for posting every day of the month, so you can bet I'll be posting tomorrow. This is what I got up to this morning...in Seattle!!! Before I start my rant about the weather, I have some welcoming to do. How exciting it was to open my blog this morning and have five new followers!! Thank you for joining me on my wacky journey to somewhere with some type of RV...all to be determined at a later date. Welcome Danyshula with lovely pictures at Picasa Web Albums, Rick and Paulette at Rick & Paulette's RV Travels, Brian 'n' Tricia at Home Sweet Home RV (also from Washington), Levonne at A Camp Host Housewife's Meanderings: An RV Adventure, and last but not least, Andy at RV-Adventure-Bound. I will be sure and check out all of your blogs and become a follower of your journey. Is there any doubt why I want to change my home base to Arizona? Look at what these poor guys have to contend with. Maybe they'll be ready to relocate with me!! Fortunately, I have four hummingbird feeders (two out at a time), so I was able to put non-frozen feeders out for them. Unfortunately, it's only gotten up to 27 degrees, with the sun shining, and they're in the process of freezing, too. I'll just rotate feeders all day. This is certainly not typical weather in the Seattle area. I moved back here from Tucson, this is my fifth (and last) winter here, to help my parents until their death. The first winter there was major flooding going on in the state, the second winter the power went out for about a week with below freezing temperatures, the next winter we had snow that lasted and lasted, last winter was fairly mild and now this winter. And then there's the rain, but I won't rant about it because it's what makes it so beautiful up here, I just don't like the gray that accompanies it and sticks around for forever. So I'm going back to make Tucson my home base. I have one more picture to show you. My frozen rain chain. I'm going to take the shelves down in the closet where all my books used to be, before I took them to the second hand bookstore. I brought the paint in out of the garage early enough that it should be warm enough for me to use when I'm ready for it. Thanks to all of my followers. So many of your comments make me laugh and all your comments make me glad that I'm part of this RVing community. Crazy Thoughts Brought On by Snow and Cold Weather!! I've had two ongoing goals/dreams: (1) to buy a motorhome and become a full-timer and (2) buy a house with a pool. I did buy a house with a pool, but it turns it was in the wrong location, i.e., it was in Western Washington instead of Arizona. I stress Western Washington because Eastern Washington is much hotter and it would make more sense to have a pool in that part of the state. Shortly after moving into the house, I decided this wasn't the kind of pool I wanted and sold it. Fortunately, we had a hot summer and selling it wasn't difficult. 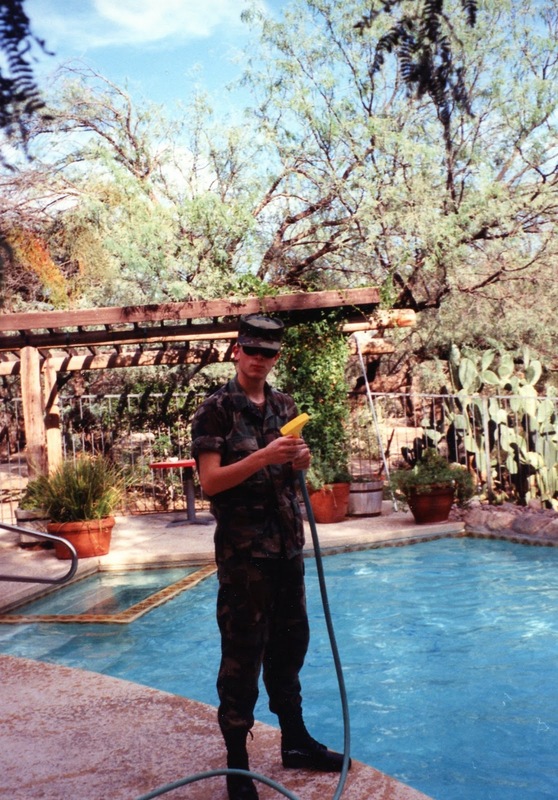 It wasn't until I moved to Arizona that I found out my preference was for an in ground pool. Turns out, this is the kind of pool I want and I want the pool boy too!! 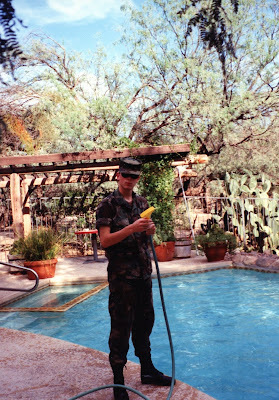 Unfortunately, the pool boy, my son as a teenager, has gone from Army ROTC to a Tech Sergeant in the Air Force. He's found much better employment and is currently unavailable. My crazy snow and cold driven thoughts compelled me to get on Realtor.com last night and look at houses in Tucson with pools. So far, I've found twelve houses to look at when I'm down there next month. Yes, they all have pools and room for parking an RV. How wonderful is that? I know that when I hit the road I'll want to be in the bottom part of our country, so to me, it makes sense to have a place in the Southwest as my home base. I'm realizing that I'll want a home base because it's looking like I'll be a part-time full-timer. Does that even make sense??? In other words, a snow bird. Only I'll be snow birding backwards because if I move to Arizona I'll need/want to get out of there in the heat of the summer, not the cold of the winter like we're currently experiencing in Seattle, cause I won't be living here anymore. Stay tuned. Everything I say (type) is subject to change. Welcome to my latest follower...msucheermom. How nice of you to start following me on a no news day. Thanks for signing on in spite of that. Do you have a blog so I can put in a plug for you? Yikes, it snowed today. That is not ok and nobody cleared it with me...I would have said a resounding NO if I'd been asked. Fortunately, it was not at my house, in fact, when I reached my house it was perfectly dry. The temperature is down in the 30s now, too cold for me, and I believe it's coming down from British Columbia. It's supposed to drop to the 20s overnight for the next 2-3 nights. Brrrrrrrrrrrr. I delivered the bowling ball I decorated for my friends 65th birthday. She was participating in a Christmas bazaar at her church, which is close to my house. Way closer than where she lives. She told me that it was snowing at her house when she left this morning. If snow is in the forecast she'll usually get it because her neighborhood is at a much higher elevation than my house. Anyway, back to the church bazaar. She's been ordering and packing a variety of nuts that are sold at the bazaar with the proceeds going to a number of agencies in the area. I'm so anti-Christmas shopping because of how we're lambasted to shop, shop, shop and buy, buy, buy that I don't buy Christmas presents anymore. I celebrate birthdays, especially now that my son isn't a little guy any longer. What I do do though, is buy a variety of the nuts sold at the bazaar and send them to my son and his wife. I leave for Tucson two weeks from today!!! This appears to be a no news day today. I'm not leaving the house, I'm decorating another bowling ball and I'm scanning pictures. I did call a friend to wish her a Happy Birthday, but I was a month early. Hopefully, I'll have more tomorrow. I was incorrect yesterday when I said my new follower didn't have a blog. She does and it is bigdawgandmumzilla.blogspot.com. Sorry for the incorrect information. I'll go check it out when I'm finished with today's post. It wasn't raining today, in fact, we saw a wee bit of sunshine, so my spirit was lighter. It compelled me to take the five boxes of books I decided I can get rid of to the second hand book store. I was pleasantly surprised that instead of highway robbery I got a pretty decent amount of money for the books. It's a relief to have them gone. I installed some shelves in a closet for all the books and now that they're gone I'll be removing the shelves and filling in the holes and painting the interior of the closet. Now that it gets dark so darn early, I find that I'm closing the curtains and wooden blinds, something I rarely did since it got dark so late at night here. Also, with most of the leaves off the trees, it feels like the "vulture McMansion" behind me can see right into my house and I don't like that. I didn't have anything on the back door so I installed a shade yesterday. I also have one for the plant window in the kitchen, to be installed shortly. I bought my ticket for Tucson today!! There are a couple RV dealerships in town, so I suspect I'll be spending some time at both of them while I'm there. I used to live at the Prince of Tucson RV park and I always check it out when I'm in town. This trip will be no different. 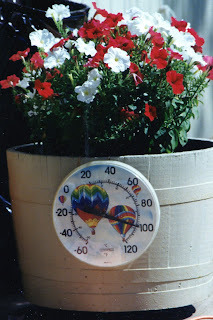 Welcome to my blog Susan Bidniak. It doesn't appear that you have a blog so I won't be able to put a plug in for you. Thanks for following my crazy journey to my future RVing. I'm waiting to hear from my friend who house/dog sits for me when I go out of town to see if she's available. Five boxes of books are loaded into the back of my SUV and ready to go to the second hand bookstore tomorrow. I'm making some headway with the pictures I'm scanning into my computer. I think I have it in my head that I have to finish with the pictures before I do anything else, regarding downsizing, that is. That's probably right because if I don't finish it soon, I'll probably never finish. I guess I'll go do that now and see how much I can get done with what's left of today. I do believe that's all for now. This is me in Spring 2011, not looking back, as I "soar" into RV land. I found this future me at Fireworks, a store located in a fancy schmancy mall close to my house, i.e., 10 blocks. I was there only because I had an appointment at the Apple store with my favorite helper, Brian. I remember telling you in another post that I don't go to malls, so I just wanted to clarify why I was there. A few doors down from the Apple store a new Microsoft store is opening. Tomorrow is the day and it looks like it's going to be a pretty big celebration. I'm sure glad I had my appointment today. I do live in Microsoft country and I do my best to maintain my loyalty to Apple/Mac. I heard not too long ago that Microsoft employees are not allowed to buy iPhones. How sad is that. I'd have one but I'm waiting for Verizon to be their service provider. Rumors say maybe in January 2011. Fingers crossed. This post was a whole lot longer until I went and messed up and lost it. I was going on and on about downsizing. I realize that I wasn't going anywhere so it's probably a good think I messed up. You know that old saying about "there are no mistakes," well, case in point. I think I'll close for now and think about where I was trying to go and see if maybe I can write a more rational post tomorrow. You're not missing anything, I assure you. Until tomorrow. This is the first of three Christmas cactus I have and this one is closest to blooming. I guess this means the season is upon us. I'm not ready for it. Actually, my son's birthday is December 7th. When he was growing up I would never decorate for Christmas until after his birthday. I'm still that way even though he's out on his own now. I bought his birthday card today, no present, just $$$. I was looking online today at possible routes to go when I do hit the road. I thought that maybe I could base stops on 24 Hour Fitness locations so that I can continue to work out with weights twice a week. That might be doable, but I might have to incorporate other gyms in the picture to fill the gaps. Then I looked at Trader Joe's and Whole Foods locations. There's a large gap where Idaho is. Looking at the maps provided, Idaho doesn't have any of the places I mentioned. I usually go through Idaho but maybe the message is to go somewhere else. I know for sure that my first stop will probably be Clarkston, WA. I mentioned in an earlier blog that there's an RV park right down by the Snake River. Next door is Costco. I'll have join Costco before I leave just so I can stock up if I need to. My friend, who turned 65 two days ago, has a Costco membership, so I usually go with her. Since she won't be coming with me when I hit the road, I'll have to join. Or, not. That's almost sacrilegious, seeing as how I'm from the Northwest. The yard people are using one of those blower thingies next door that drives me crazy. I'm going to leave my office so I can get away from the noise. It's either that or start screaming irrationally and I choose to exit gracefully. End of post for today. I don't mean to make my issue yours, but I'm seriously impacted by gray and rain and that's what's going on presently here in Seattle...surprise, surprise. I am doing what I can to survive, i.e, I had acupuncture this morning to get the serotonin moving and I'm currently sitting in front of my Verilux Happy Light Energy Lamp. The box says the lamp will "beat the "Winter Blues" and effects of seasonal change; Improve mood and energy; Regain focus, concentration and productivity." I also just had a cube of chocolate, so I think I've covered all bases. Nope, I didn't. Covering all bases would mean getting out of here...Seattle. I'm working on it, I'm working on it. I had lunch today with a friend who recently returned from a 48 day cruise to Australia. She also turned 65 yesterday and has bemoaned that fact every time I've talked to her since she returned. I say bring them on, but she's not happy about turning 65. I pointed out that it's better than the alternative, to which she agrees. I finished the yard art project for her birthday present and I took her a picture of it since it's still curing and unable to leave my house at the moment. I think it turned out well and I love the color. I think I'll have to do another one for me. She really likes the stand but, unfortunately, it doesn't go with the ball, it stays at my house cause I really like it, too. Downsizing is tough, isn't it? I have a box of Hummels my mother started collecting when we were in Germany oh so many years ago and it's a pretty sizable collection. While I like them, they don't fit in with my decor and I've carefully wrapped them and have them safely packed into a box. It would seem that if they've been in a box for six months or longer (just a random number), they aren't needed, therefore get rid of them. Right? Can't. Or is that won't? Then there's the buffet. Oh, the buffet. This lovely piece of furniture takes up a whole wall and has tons of storage. It was my parents. I love it and I hate it because I love it. And I don't know what to do with it. When I was looking at a particular house in Tucson, I was actually basing my decision to buy it on whether this piece of furniture would fit. How insane is that??? I decided not to buy the house and the buffet ultimately didn't have anything to do with that decision. Realizing that I didn't want to spend a ton of money on a house and be stuck in one place helped with that decision. 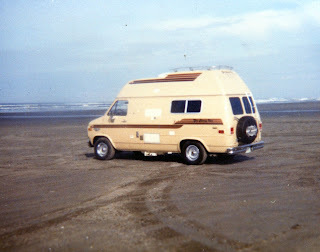 Which, once again, led me to RVing. But that doesn't solve the dilemma with the buffet or some other furniture that I haven't even brought into this discussion. Most of the furniture in the house will go to consignment. The only furniture in the house that's mine is my bed and the glass desk I bought a few months ago for my computer. I guess if it doesn't go to consignment it goes into storage. If it goes into storage, again, that random number of six months, why hang onto it? DID ANYONE ELSE HAVE THIS DILEMMA? AARGH!!! I have downsized so much since my dad died January, 2008. Downsized, ripped up, painted, repaired, replaced, created, etc., etc. I'm really at the tail end of it. I'm not selling the house but I can't leave stuff in it if I decide to lease it. If I don't lease it, then no problem. No problem with the buffet, no problem with my car if I decide to go with a fifth wheel because I'll have a place to store it. Geez, are there any easy decisions or am I just blowing this out of proportion??? Maybe I better turn my happy light off, I think I've gotten too many rays. Does that mean I have to change my salutation? Welcome to my blog Kate of Kate and Terry - Travels in Cholula Red; Dave Murphy; Pam and Randy of Roadrunner Chronicles. I finished scanning over 1,000 slides and started on a container of pictures and found this one taken at Ocean Shores, Washington. My husband and I bought this Get Away Van and only used the refrigerator. Shortly after we bought it we drove up to Vancouver, BC to have the drivers and passenger seats changed to captain's chairs that swiveled. We checked out Stanley Park and found an RV park nearby. I could not talk John (my husband) into checking into the park so we stayed in a hotel. I remember feeling quite put out and wondering what we bought it for if we weren't going to camp in it. If I recall correctly, we had to put in a porta potty and it didn't have a shower, but at least it was fun for our day trips. I remember trying to talk him into quitting Boeing and hitting the road back in 1975, two years before we married. Now that I'm collecting retirement from Boeing it was probably a good thing we didn't do that, but who knows. 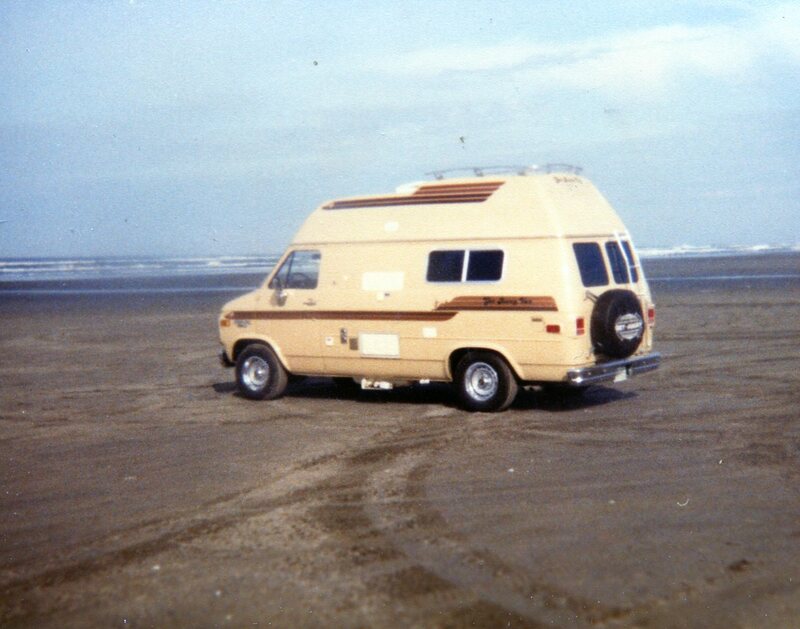 Clearly, the RV bug hit me a long time ago. Welcome Karen V., a new follower. It doesn't look like you have a blog so I don't have anything to plug for you. Enjoy and thanks for following. I went and looked at fifth wheels today and I'm in love...with the Jayco Pinnacle 36REQS (introduced one month ago!!). OMGosh. I've been aware of Jayco for years but what I didn't realize is that they're a privately owned company and many of their employees are Amish and Mennonite. I knew about the Amish but not the Mennonite. I believe it after looking at the interior wood details. Before I forget, this particular model has a built in vacuum and I really like that. One less cumbersome thing to store and mess with. The bed is king size which I don't want. According to the brochure king size is standard but I do remember the salesman saying I could get queen size. This chair becomes this a step stool in order to reach the cupboards above the tv/fireplace. The tv is behind the fireplace until it's time to watch it, then it rises up for viewing. The chair stores to the left of the fireplace. The kitchen is fantastic. I love the bar with the stools, but see below for replacement. Notice the rounded cupboard at the entrance to the kitchen...it opens and has shelves in it. I would probably replace the wooden stools with this one. I have another one in the garage still in the box. I haven't needed two stools so I haven't taken the time to put it together. This will be my last picture because I'm going nuts trying to get them to go the way I want for this post. AARGH. I want to show the detail of the dining room chairs. The padded seats lift up for storage. If I buy a fifth wheel I need a truck. The salesman said I'd need a one ton and he recommended a diesel. I'm not crazy about a diesel because of the noise and smell. He said they're a lot quieter now, we didn't get into the smell. I mentioned once before that I think fifth wheels are more livable. This one is certainly more livable than the one my son and I lived in for two years which was seven feet shorter and had no slideouts. I wouldn't have to worry about a tow vehicle, just what I'd do with my SUV while I'm on the road. Unless the weather is really awful tomorrow I think I'll go look at RVs. I think I'll look at Class C's this time and test drive one or two. I realize this picture is of a Class B, but I was really tempted to buy it a couple years ago. I'm glad I didn't because I don't think there's enough room. As you can see, there's no basement storage. I think this type of RV would work better for quick weekend jaunts than full-timing. It drives me crazy when I go to an RV dealership and the sales people won't leave me alone. This guy wouldn't get out of the way, obviously, when I was taking pictures. If this were mine, my dog would be laying (lying?) down in the narrow aisle and I'd be stepping over him to get from the front to the back. Not fun. This is a slow news day for me. We had a lovely sunny day and I decided to prepare bowling balls outside so that I can continue decorating them as yard art. A good friend of mine is turning 65 on Sunday and I think I'll decorate one for her yard. She loves aqua so I spray painted the ball today and I'll get started with the beads shortly. Yes, it's going to be late because I just decided to do it today and it takes me longer than two days to complete one. She just returned from a 48 day cruise to Australia and I'm excited to hear how it was. She said she'd call me when she recovered and that was Monday, so her recovery time must be taking awhile.